Once more unto the breach, dear friends. Well, hold on - that's not 100% true. I did make it a slightly lighter week on mileage since it was my first back from the marathon. So next week unto the breach? This was surprisingly hard, although really I shouldn't be shocked to need some easing back in after a full week completely off. How early is too early to start getting jazzed for Wine & Dine? 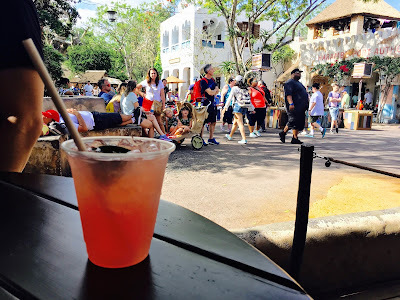 I've already begun planning my outfits (Disney Dandy[TM]) and daydreaming about picking up one of those new spiked Jungle Juice drinks from Dawa Bar and listening to Burudika. WHY IS THAT NOT JUST MY LIFE??? Oh well. Week in review, take us out. - Disney In Your Day assembles a WDW monorail pub crawl. - Disney Nerds looks back on time spent as a WDW Cast Member fondly. - The Tomorrow Society dreams big and reshuffles extinct WDW attractions. - A Pinch Of Pixie Dust explores Disneyland's Grand Californian hotel club level. - Rolling With The Magic zeroes in on chill places to relax around the World. - EPBOT hacks some Figment ears, among other things. Gotta try this on mine!